This is a great fantasy book! It reminded me a lot of Tamora Pierce's "Protector of the Small" series, which is also about a girl who trains to become a knight. 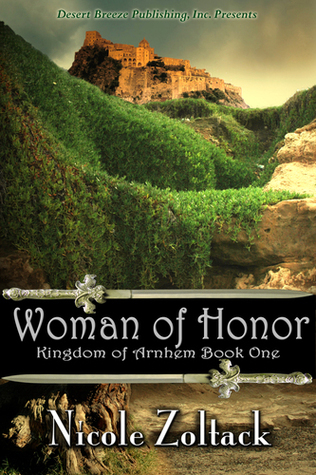 Woman of Honor is perfect for fans of that series. I really enjoyed Aislinn's character. I love how she knows what she wants and is determined to keep fighting, no matter what. She's easy to admire, and I liked watching her journey as she grew up and became a knight. I also liked the addition of secondary characters, like her friends Caelan and Geoffrey; they definitely added to the plot. The plot held my interest. It starts off when Aislinn is seven years old, and continues up to the point when she's an adult. So there were always lots of plot developments happening, as Aislinn gradually learns to fit in at the palace and help keep her country safe. The ending was definitely full of action and had me biting my nails. There were a couple things I didn't quite like. Sometimes, a conflict or problem in the story seemed to be resolved a little too easily and conveniently. And there's the fact that Aislinn is seven during the first part of the story. The way she talks and acts makes her seem much more mature than her years. I guess that in a different time period, young children would grow up more quickly. Still, it seemed like she was a little too mature for her age at times. But these are minor problems, and I still enjoyed the story a great deal. 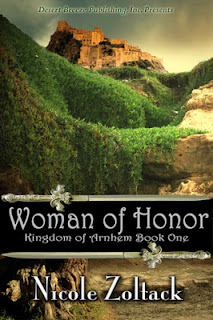 With a well-developed storyline and a great cast of characters, Woman of Honor is a perfect read for fantasy fans. You'll especially love this if you're a fan of Tamora Pierce's work! Thank you for your kind words, Kaitlyn! I'm so glad you enjoyed it.